We're just going to come right out and say it: Cuticle nail art gives us feelings. We saw this a while back with a Hey Arnold!-themed mani that extended way, way past the nails it was painted on. 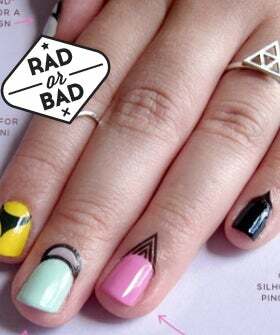 It seems that cuticle nail art has grown up a little bit in the meantime, returning in a more sophisticated manner: Where there once was Helga's iconic pink hair bow, now there's geometric shapes in a new nail art set from Rad Nails. Our first thought? It's not for us. The whole point of painting one's nails is to, well, paint one's nails — not one's fingers. While the Hey Arnold! mani had us wondering how the polish would stay on the skin, this nail art involves a temporary tattoo situation. Does knowing that it has more staying power make us less confused by the idea of cuticle nail art? Maybe. We like to live outside of the box, but our nail beds might be one box we'd like to remain within. Are we boring? Let us know: Does this more sophisticated version of cuticle nail art speak to you? Rad Nails Cuticle Tattoos, $6, available at Rad Nails.